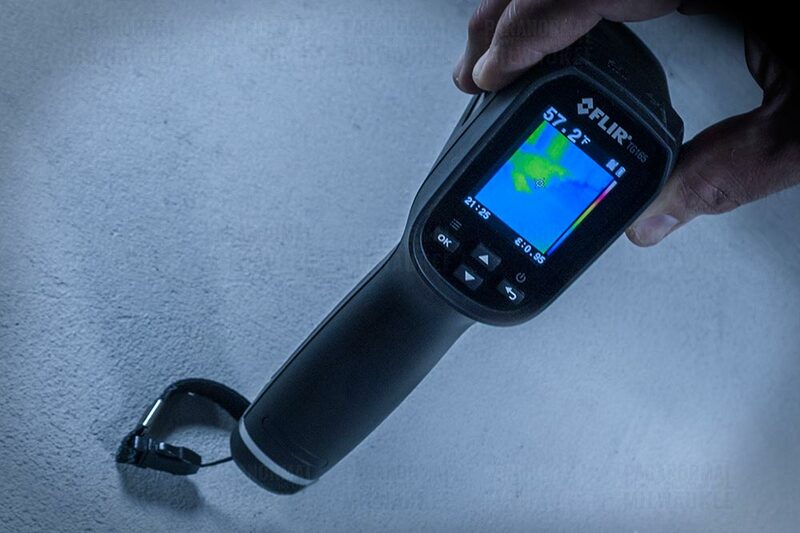 Although many paranormal investigation groups swear that they’ve captured spirits via thermal camera, PIM uses the FLIR TG165 Thermal Imaging Camera primarily to rule out wildlife in a location that could contaminate our evidence. A thermal imaging camera is a camera that changes thermal energy into a pictorial form. Most cameras will display the range or thermal energy detected using multiple colors with blues and greens indicating cooler temperatures and yellows, oranges, and reds indicating warmer temperatures. Some models of cameras will only display these variations in grey-scale with the darker shades indicating cooler temperatures and the lighter shades indicating warmer temperatures. FLIR (Forward Looking Infrared Radiometer) is the most well-known maker of thermal imaging cameras, but there are others out there. In the field of paranormal investigation, there is an idea that “cold spots” are indicative of paranormal activity. The biggest issue with this idea is that it hasn’t been proven, and most claims of “cold spots” are anecdotal and not backed up with actual measurements from a device that contains an accurate temperature sensor. Someone simply reporting that they “feel” a cold spot is not sufficient evidence that an actual change in temperature has occurred since the perception of a temperature change is easy for some to be mistaken about. A big problem with using a thermal imaging camera to detect “cold spots” is how a thermal imaging camera detects radiant heat. In order to determine the temperature of something, a thermal imaging camera detects the temperature of the heat reflected off the surface of an object. To our knowledge, whatever the paranormal is doesn’t have any surfaces, so it would be impossible to use a thermal imaging camera to detect a paranormal “cold spot” even if one existed. In PIM, a thermal imaging camera is most useful in determining animal infestations when investigating in the dark, or at a safe distance. Often paranormal claims can be explained when an animal infestation is uncovered. However, there are a lot of video clips and still images taken using a thermal imaging camera that seem to show something anomalous. So what could those be? There are many things you need to consider when using a thermal imaging camera. The first, is what is the effective distance for that camera? Many thermal imaging cameras (especially the lower priced models) are designed for use within a few feet. If you are viewing things through the camera at a greater distance than that, the camera will not provide accurate information as to the heat signatures displayed on the camera. When viewing objects outside of the effective distance for the camera, the objects being viewed will lose detail. Edges will become rounded and the objects shapes will be distorted. This results in what appears to be anomalous images on the thermal imaging camera since what is seen on the camera is very different from what can be seen with our eyes. However, this is simply due to the camera being used beyond the effective distance for the optics for that particular camera. To remedy this, know what the effective distance is for the camera you have and don’t try to use it beyond that distance. Another major thing one needs to remember when using a thermal imaging camera is the scale. Most cameras will have a dynamic scale, which means the temperature and corresponding cold to hot (blue to red or dark grey to white depending on the camera setting) scale will change depending on the range of temperatures that the camera is detecting. As an example, if you were to point the camera at a living person, the blueish tones would be cooler (less than 60F) and the redder tones would be warmer (around 98F). Now, if you moved the camera away from a living person and pointed it at an empty room you would still see all the colors (blue, green, yellow, orange, red) however, the scale on the camera will change to something that ranged from 60F-100F to something that ranges from 50F-60F (depending on the time of year, indoors versus outdoors, climate controlled versus not, etc). Since the range of temperatures is very different from one scenario to the other, you need to take that into account when using the camera. If scale is not considered, undue excitement may be had over a “warm” spot in an empty room or a “cold spot” located near someone living. Another point to consider when using a thermal camera is that heat reflects off anything that is smooth and it is very easy to pick up reflections of heat from yourself or others that are present when using the thermal imaging camera. This is how many “apparitions” are captured using a thermal imaging camera when someone points the camera at a window or mirror and the reflection of the camera user’s own body heat is captured as a reflection. Glass and mirrors might be an obvious source or reflections but items such as stainless steel appliances, tile, and even laminated paper can all be reflective enough for the sensors in a thermal imaging camera to pick up. Care must be taken when using a thermal imaging camera to rule out these possible contaminants before considering something captured as being paranormal. The last major point to consider when using a thermal imaging camera is residual heat. The same thing that happens when you use the restroom right after someone else and you have a nicely warmed toilet seat occurs whenever a warm living creature comes in contact with an inanimate object and care must be taken to not mistakenly “capture” this heat transfer as something paranormal. If someone is standing, sitting, or leaning on something and then gets up and leaves, the residual heat left by that person’s (or animals) body can be picked up by a thermal imaging camera. This can cause someone to believe there is a heat signature where there is not a living creature, but the possibility that someone or something living was there and has moved needs to be considered. This can happen when there are animal infestations in a building and the animals vacate a location when investigators enter as well.